For years I have made these Make-Ahead Butterhorns, and I still love them. They’re super delicious and you do most of the work ahead of time. You just have to let them rise for about five hours when they’re in their frozen state. They are perfect for when I can plan ahead, but at other times when I need a bread for dinner on a moment’s notice, they are so convenient. 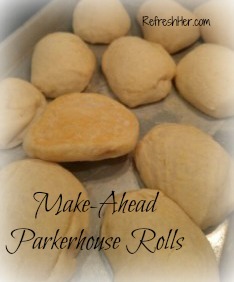 At Thanksgiving I tried Ree Drummonds Parkerhouse Rolls. These are also make-ahead rolls, but they are completely ready to pop into the oven for a quick ten – twelve minute browning and they’re ready for the table! They’re like the old Brown and Serve kind of rolls, only ten times tastier! They are so delicious, and the fact that they require no major time when you need them make them a great staple to keep in the freezer! Here’s the recipe from Food Network: This recipe yields 72 rolls. I halved the recipe, but if you need rolls for a huge crowd, make the whole batch! Stage 1: Combine the milk, sugar and 2 sticks butter in a large pot. Bring to a simmer and when the mixture is hot (but not boiling), turn off the heat and allow to cool to warmer than lukewarm, 30 to 45 minutes. Stage 2: Sprinkle in the yeast and add 8 cups of flour. Stir to combine, then cover and allow to rise for 1 hour. Stage 3: After 1 hour, add the salt, baking powder, baking soda and remaining 1 cup flour and stir to combine. Turn out onto a floured surface and knead the dough for 8 to 10 minutes, then form into a ball, cover with a towel and allow to rise in a warm place for 30 to 45 minutes. Stage 4: Melt 2 sticks butter in a saucepan. Roll out the dough to 1/2 inch thick. Cut circles with a 2 1/2-inch cutter. Dunk each circle in the melted butter, then immediately fold in half and place on a baking sheet. Press lightly to encourage sealing. Cover with a towel and allow the rolls to rise 30 to 45 minutes. When ready to cook and serve the frozen rolls, preheat the oven to 350 degrees F. Melt the remaining stick of butter in a saucepan. Place the frozen rolls on baking sheets and brush them with the melted butter. Bake until golden brown, 14 to 16 minutes. Brush them with additional melted butter if you like and let them sit for 1 minute. Serve while still warm. Pictured below are the four “stages.” It may seem like a lot of work, but it’s mostly just letting the dough rest or rise. These are easy and worth the effort! Just bake them the first time until they’re lightly browned, as pictured. I have these rolls ready in my freezer for Christmas dinner at my parent’s house. All the work is done – the easy part is all that’s left! Last Monday’s recipe was also a make-ahead one – can you tell I like to be ahead of the game when I cook?! What do you do to work ahead in meal prep? 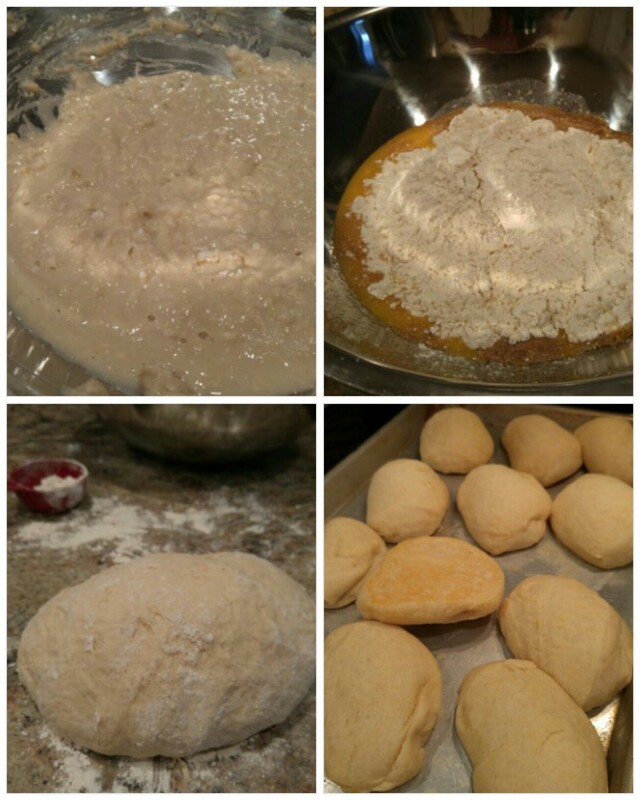 I don’t know if it’s the same recipe, but that is how my grandmother made angel biscuits. I can’t wait to try it and see if it’s the same! I like to make cookie dough to scoop out & freeze ahead of time. And I buy chicken breasts when they’re on sale & bake several pounds of them, then shred, portion & freeze them for chicken pot pies to take to people when we take a meal. Smart! Isn’t it great to pop out just a few cookie dough balls from the freezer and have dessert! Those rolls were super yummy for Thanksgiving!